Are you ready for your close up? 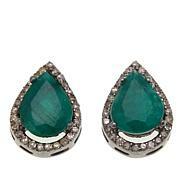 Blue-green amazonite earrings framed in layers of sparkling black spinel will help you strike a memorable, artistic pose. 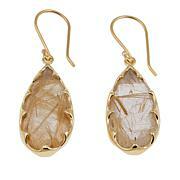 Slip on these dramatic, dangling drops to add a touch of unexpected glamour to favorite, everyday outfits. 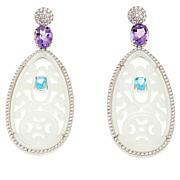 The design is nice, and the earrings have nice presence with the contrasting colors. However, as the previous reviewer stated, it came broken. One black spinel was missing from the earring and was loose in the bag. This is upsetting. This earrings are not cheap. As much as I love to buy jewelry from HSN, I have to admit that the quality is getting worse. 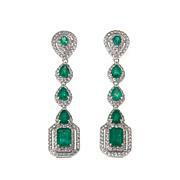 I am going to take the earrings to my jeweler and see if it can be fixed. I will try to keep them since I love the design. My pair arrived with 8 stones in the box. Three of the stones were broken in half so theres no repairing them in my city. These are $500 earrings. Ridiculous. These should be pulled from inventory. Arrived with black spinel stones in the bottom of the box. And I do mean stones....many, many stones. I can see that despite how beautiful these earrings are and how badly I want these it's not going to happen. Also, 3 of the 8 items I purchased with these arrived with broken stones in the box. Your customers deserve better than this.